One of an employee’s first actions of the day is to visit the Accenture Portal, the company’s main means of keeping its workforce connected, informed and enabled. Periodically updated over the years, the portal has served Accenture well. But it was time for a something more than just a technology refresh. It was time for a transformation of the way Accenture delivers all forms of internal communications. A Marketing & Communications and internal IT organization project team applied new ideas around creating a digital and personalized communications experience for each employee. They wanted to put in place a sleek platform more closely mirroring the way individuals are familiar with getting information in their personal lives. 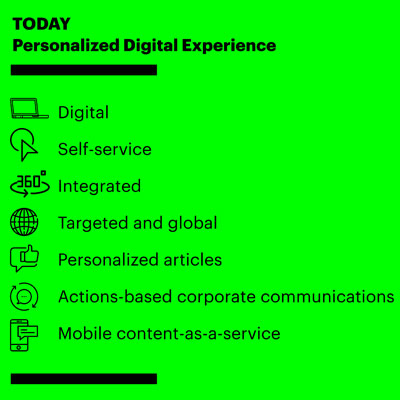 The result was the development of a new digital platform—a portfolio of several initiatives modernizing Accenture’s approach to creating, consuming, finding and sharing content across Accenture. The one chosen for bringing about the biggest shift to Accenture’s information-sharing culture was a revamp of the Accenture Portal. "Transformation gave us the opportunity to change the way we consume content, to go from passive, e-mail-heavy consumption to more dynamically presented, personalized information that pulls employees in. We wanted to make life easier for employees." 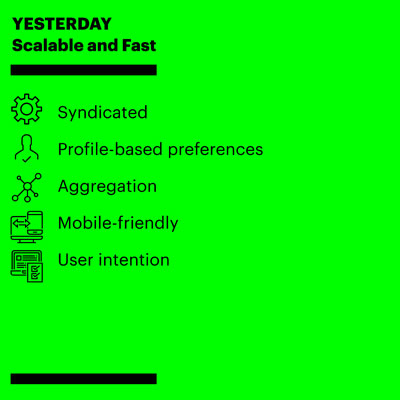 The project team methodically made changes to the platforms that hosted Accenture’s corporate intranet. They also made changes to the internal applications that served up information and content to employees—by implementing three main technology components. Deployed new, corporate intranet Web publishing platform. New Elasticsearch functionality with custom components. More control and visibility into search results and rankings. Allows search to evolve and improve over time. Pulls targeted articles from content management system. Delivers navigation based on a user’s demographics. Provides personalized information from line of business systems. Hosted on serverless architecture on Amazon Web Services cloud computing service. With the back-end technologies in place, the project team overhauled the portal functionality and interface to focus on the individual employee—rather than the general population. The goal was to make the new portal a destination for Accenture people to get and share information. The communications strategy moved away from web page-based content that becomes stale quickly, requires periodic e-mails to remind people to “see what’s new” and depends on a desktop web browser. It instead moved toward an article-based approach that keeps topics fresh and facilitates content syndication onto several web and mobile platforms. The new, mobile-responsive Accenture Portal is providing Accenture people with a highly personalized, article and subscription-based location to get relevant company information through a more intelligent, data-driven system. A new “alerts and notifications” feature keeps the more important, action-oriented tasks at the forefront so time-critical items are not lost in e-mail clutter. The portal is lessening e-mail overload and leaving e-mail for more day-to-day, role-related communications. Looking ahead, the project team is planning to increase the number of content sources that can be surfaced and number of end points for consuming content. The team is also planning to expand on the reporting and analysis to give content owners better insights into types and style of communications that are attracting the highest readership. A new, Accenture-developed enterprise search capability better taps into our company’s rich content. Driving a digital change agenda across Accenture so it can operate in new ways.